All container trucking companies and their trucks desiring to serve the port’s marine container terminals must meet certain criteria to be eligible for an Access Agreement under the Truck Licensing System to gain access to the federally-owned port property. and includes requirements such as minimum fleet size for companies, minimum truck age, minimum safety and environmental requirements. For more information regarding container truck access at port facilities, contact us at 604.665.9333 or email [email protected]. Please complete the Sponsorship Agreement, the Driver Consent Forms, and the Joinder Application. The Port of Vancouver was the first port in Canada with stringent environmental requirements for container drayage trucks to reduce air emissions, implemented by the Vancouver Fraser Port Authority in 2008. Compliance with the environmental program is mandatory to gain access to port facilities. The key environmental requirements for truck approval in Truck Licensing System target engine age restrictions and idle reduction. This includes mandatory opacity testing, idling reduction and a minimum truck age requirement. Annual opacity testing is required for all Truck Licensing System trucks that are 10 years old and older. Annual testing is to be done by an approved opacity testing facility and, to be considered for approval, must read 20 per cent or less. Currently, new trucks requiring port facility access and approval in the Truck Licensing System must be from 2007 or newer. Effective January 1, 2016, any new truck requiring approval in the Truck Licensing System must be from 2010 or newer. , showing the installation of an approved emissions reduction measure such as a diesel oxidation catalyst. 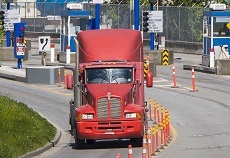 Prior to the appointment of the British Columbia Container Trucking Commissioner in 2015, a Container Truck Dispute Resolution Program conducted audits on behalf of the Vancouver Fraser Port Authority to determine if Truck Licensing System trucking companies were compliant with the minimum rates of remuneration required for their drivers. Following an audit, the program provided a summary of its findings to the Vancouver Fraser Port Authority and made recommendations regarding sanctions, after which the port authority would then make a final decision. The decision digest was created to provide transparency around the decisions made regarding rate remuneration.